That's what the West Linn girls basketball team accomplished this year — almost everything. No, the Lions didn't win the Three Rivers League championship — that honor went to Tigard. And no, the Lions didn't win the Class 6A state championship — that honor went to Southridge for a second straight season. But West Linn accomplished everything else this year, going 14-2 and finishing second in the TRL, winning two playoff games to reach the Class 6A state tournament for the first time since 2012, winning a school-record 25 games and — thanks to its 38-33 win over Beaverton on Saturday — taking third in the state tournament, one of the best finishes in school history. "School history — it is awesome," said West Linn senior guard Brooke Landis, who hit two 3-pointers and finished with six points, one steal and one assist against Beaverton. "And even if we didn't get the state championship, to get 25 wins and make it as far as we did was an awesome accomplishment." 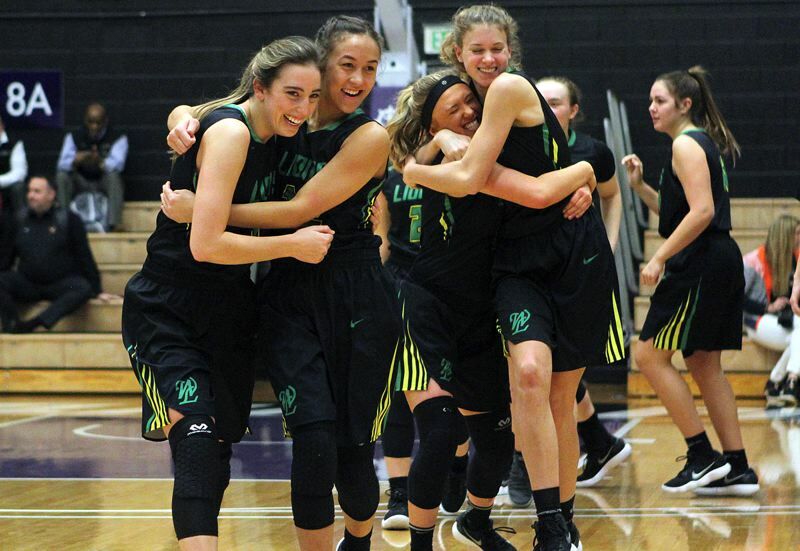 "It's definitely not what we wanted — like any other team, we wanted to take first — but I couldn't be more proud to go out with the win like we did," said West Linn senior guard Lexie Pritchard, who finished with six points, five rebounds and an assist. "I couldn't have asked for a better game, a better team." "It feels really good. I'm glad to end my high school career on a win and get third place at state," added West Linn senior guard Kennedi Byram, who led her team with 10 points and two assists. "Our girls have never gotten that far before and it feels so good." With the victory, the fourth-ranked Lions finished their 2017-18 campaign with a 25-4 record, those losses coming to TRL champ Tigard (twice), state champion Southridge and to Valley View, California, in the finals of the Nighthawk Holiday Classic. The third-ranked Beavers, meanwhile, lost for a second straight time and finished their year at 23-5 after taking second to Southridge in the Metro League. At the start of the game, the Beavers trailed just 6-5 after freshman Alexa Borter took a pass from sophomore Mary Kay Naro and drilled a 3-pointer from the right wing 2 minutes and 52 seconds into the game. But the Lions took control the rest of the way in the first quarter, ending the period on an 8-0 run that gave them a 14-5 lead. Freshman Aaronette Vonleh provided the first four points there, taking lobs from Byram and Pritchard to score back-to-back baskets inside, Landis followed with a 3-pointer and freshman Cami Fulcher added a foul shot to give West Linn that nine-point lead at the end of the quarter. The Lions then tacked on another five straight points at the start of the second quarter to stretch their scoring streak to 13 straight, getting a Landis "three" from the left wing assisted by freshman Makayla Long, and foul shots from both Pritchard and Vonleh to extend their team's edge to 19-5 with 5:49 to go in the half. "It was just working on finding the open man and trading a good shot for a great shot and playing lights-out defense," Long explained. The Beavers snapped a scoreless streak of 7:41 when sophomore Laura Erikstrup hit a free throw with 5:27 remaining in the period, but the Lions' lead was still 13 points — at 24-11 — at halftime. In the remaining minutes of the half, Erikstrup and Vonleh traded hoops, while Borter and Pritchard traded "threes." It wasn't quite so simple in the second half, though. The Beavers, after their slow first-half performance — they shot just 19 percent from the floor (4 of 21) in the first two quarters — kicked off the third period with a 10-4 streak highlighted by 3-pointers from Naro and Borter, and capped it with a Naro basket in the key that cut their deficit to 28-21 with 3:07 to go in the period. The Beavers still trailed by seven — at 30-23 — at the start of the fourth quarter, and then fell behind 34-25 when Byram scored on a left-handed drive with 5:00 remaining in the game. Undaunted, Beaverton responded with seven straight points, getting a basket in the key from sophomore Sydney Erikstrup, two foul shots by freshman Mackenzie Naro and closing within 34-32 when Sydney Erikstrup took a pass from Mary Kay Naro and buried a "three" from the right wing with 3:19 left to play. But the Beavers failed to score on their next two possessions and Byram hit two foul shots to make it 36-32 with 1:48 remaining. Laura Erikstrup answered with one free throw with 1:33 left, but then, after forcing a West Linn turnover, Beaverton saw Mackenzie Naro and Mary Kay Naro miss "threes" on their next two possessions, and Byram tacked on two foul shots with six seconds remaining for the final 38-33 margin. "We faced some adversity there, but we came back and we came out the way we wanted to," Pritchard said. "I'm so proud of this team." "We wanted to end the right way for our seniors and just be in the best place possible at the end of the year," Long added. "We worked very hard every day at practice and it paid off." Vonleh finished with nine points and five rebounds in the win, while Long had just four points, but grabbed a game-high 13 rebounds and added two assists, one block and two steals. For Beaverton, Laura Erikstrup and Borter led the way with nine points each, Erikstrup adding eight rebounds, one assist, one block and two steals. Mary Kay Naro had six points and three assists for the Beavers, and Sydney Erikstrup had five points, four rebounds, one assist and three steals.